According to Mike Komp M’13, M’14 few people have ever heard of Armstrong Creek, Wis., pop. 409. Despite its lack of notoriety, growing up in that rural northern Wisconsin town instilled in Komp a love of land and a respect for agriculture. This passion drove Komp to earn a bachelor’s degree in natural resources. He furthered his education at Saint Mary’s with an M.B.A. in 2013, followed by an M.S. in Geographic Information Science (GIS) (now the Data Intelligence and GeoAnalytics program) in 2014. 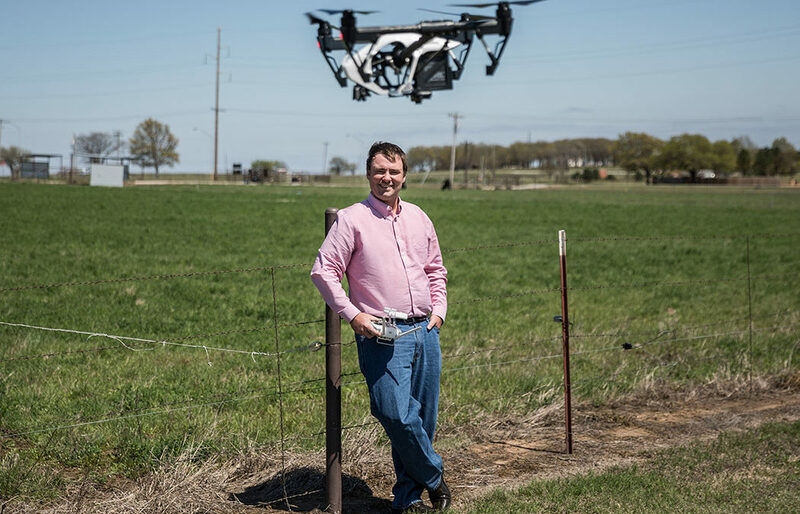 In his position as a technical program manager in ag technology at the Noble Research Institute in Ardmore, Okla., Komp is using all three of his degrees as he returns to his roots — helping farmers while promoting sustainability and land stewardship. “Both the M.B.A. and the GIS programs helped catapult me to doing some very exciting work related to technology and agriculture,” Komp said. Noble is a nonprofit agricultural research organization delivering solutions to agricultural problems. The company focuses on research to help farmers and ranchers improve land stewardship and productivity. In this way, Noble strives to produce lasting benefits for humanity and the natural resources upon which we all depend. Komp is especially proud of a drone program he’s played a significant role in implementing. “We’re using drones to gather all sorts of data related to agriculture and remote sensing, which sets us apart from similar organizations,” he said. Using soil sensors and satellite data, Komp said he and others at Noble are working to attach a dollar amount to these practices so they can demonstrate the value of what farmers and ranchers are doing in being good stewards. “It’s our goal to put money back in their pockets when they’re going above and beyond what’s expected,” he said. He believes every step of his career and his education has led him to his current position. “I worked for GeoSpatial Services (GSS) at Saint Mary’s full-time for six years before I decided to go after a new opportunity,” he said. “The biggest thing that helped me at Saint Mary’s was the opportunity I had while working at GeoSpatial Services to pursue my M.B.A. at the same time,” he said. “Getting both the real-world business experience of GSS and the real-world applications that the M.B.A. group provided has really put me in a place where I can understand how the business side of things work and apply that day to day in everything that I do.